Stock markets have reached new highs last week. 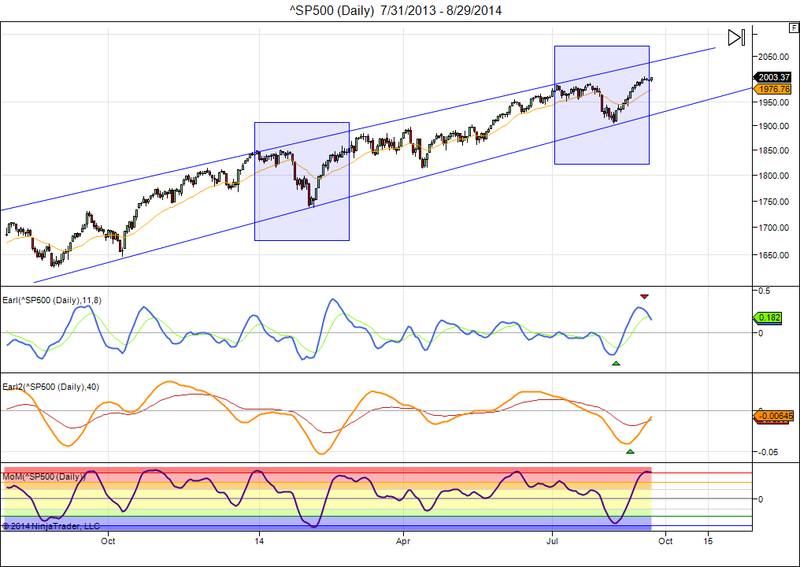 The S&P 500 has climbed above 2000 for the first time and now sits right at our Top target at 2004. Further gains appear likely, but September and October are two months with a rather bad reputation and that may prompt investors to take some profits. The recent price action is very similar to what we got at the start of 2014. After a sell-off the market has swiftly climbed to new highs. 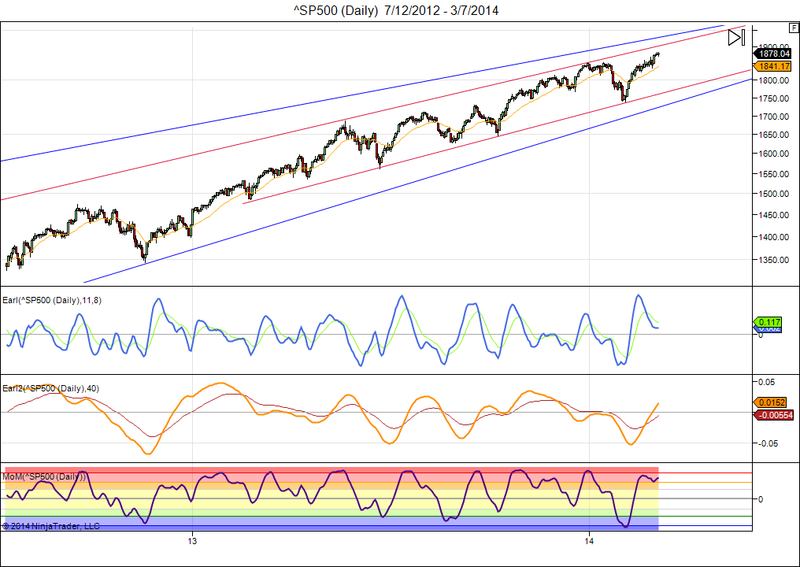 Based on the trend channel a further climb to 2050 is feasible. But we have just entered a lunar red period and the Earl and MoM indicators appear to have turned down already. So, I think the market will first try to digest the recent gains. The wave did fairly well in August, marking the low early in the month and then climbing into a high on the 29th. Expected weakness in the middle of the month did not materialize. 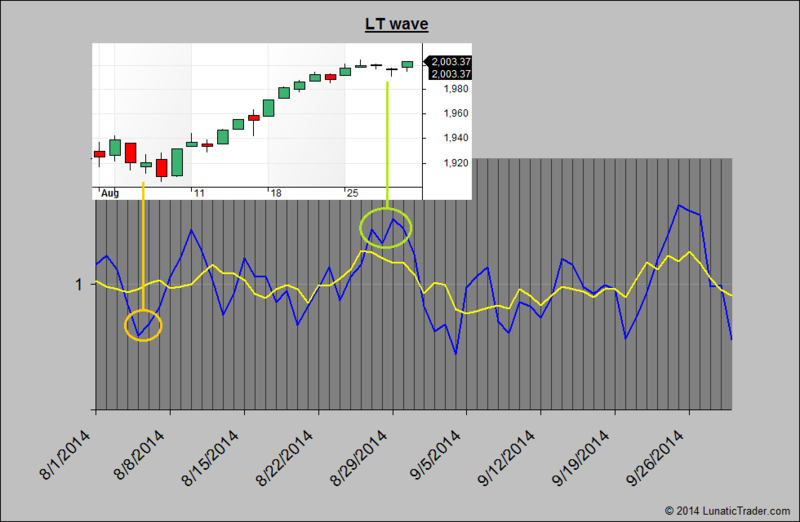 For September the LT wave projects a period of weakness until the 20th, and a high on the 25th or 26th. 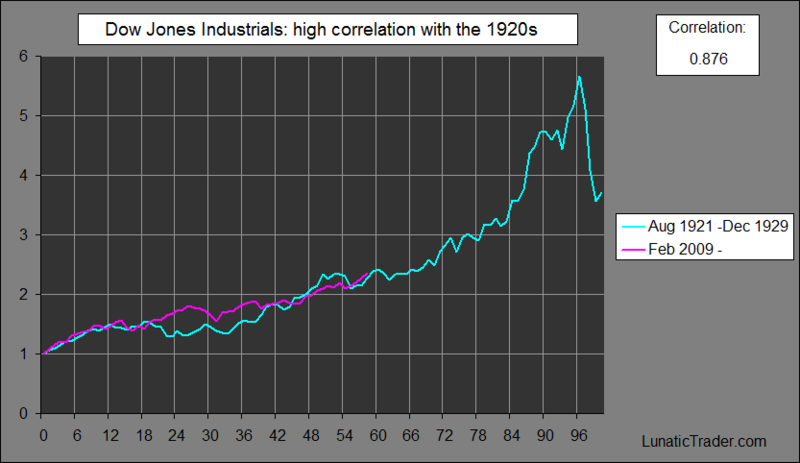 The Dow Jones Industrials continues to mimic the price action of the 1920s very closely. We are now approaching the point where the market took off after almost a year of sideways consolidation. So, it will be interesting to see what happens. * After a strong week in the stock markets we remain with a fully bullish picture and upward weekly MoM for most major indexes. A pullback will start eventually, and stagnating MoM in the daily keys will normally offer us the first clues when the current rally is nearing an end. Right now it says: all clear. * Just repeating what I said last week: it is always hard to tell how far a move will carry… best is to go with the flow and respond when the situation changes again. Today’s daily key reversal table shows what happens when we go with the flow: all signals profitable (blue), 1-4% profits within days or weeks. There is no need to predict the top, the system will automatically tell us that some kind of top is in when a given market closes below its key reversal level. Why is following trends so hard to do when it appears so simple? A: Our ego wants to forecast, not follow. Ego wants to buck the trend. * In other world markets there are no major changes this week. I notice that MoM is turning up for the Russell 2000 index. That doesn’t mean the pain is over for the small caps, but it increases the odds that we will get a rebound rally or a sideways period. A weekly close above 1147.64 would put Russell 2000 in the bullish camp again..
* Bonds (TLT) continue to hesitate near their Top1 target at 114.60. * Gold tried hard, but has finally succumbed and closed below its weekly key level after 14 weeks of trying the upside. We have been telling for months that gold would go the way of the Euro. Both are in weekly bearish mode now. Will it be a short venture, or the start of a lengthy bear move? I don’t know. * The Euro appears to be fighting back at the 1.36 level and has its daily MoM turn up from rather low -5 level. That offers some short term hope for both the Euro and for gold. But we have to see if they can claw their ways back above their respective daily key levels. * Oil price is sputtering as well. It was once again rejected at its long standing Top1 target at 104. * Our weekly key reversal levels for the 30 Dow stocks are available here. 26 stocks are bullish this week, up from 25 last week. Above 20 is healthy, see : Keeping an eye on the Dow stocks. Note: this most simple indicator has been saying “healthy bull market” since the middle of April, when the number of bullish stocks climbed above 20 again. Goes to show that investing doesn’t have to complicated. * Little change in our weekly key levels for major stock indexes. 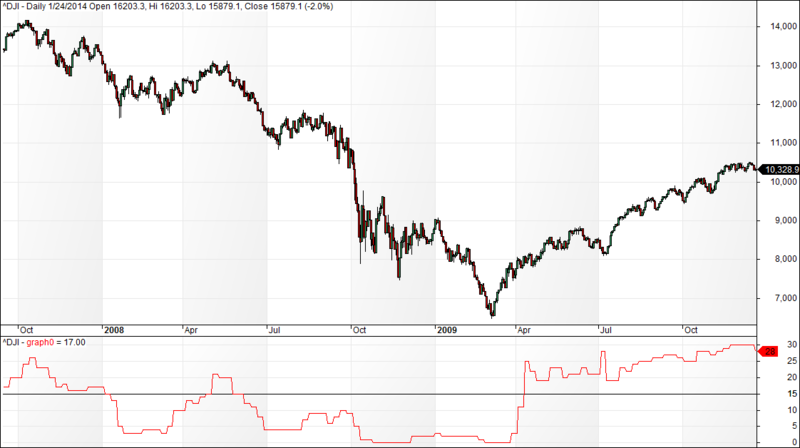 For Nikkei we have MoM turning down, which indicates a continuation of bearish mode, now in its 8th week. * On the daily level the Nasdaq and Nikkei remain in bearish mode, while the DAX is back to fully bullish. 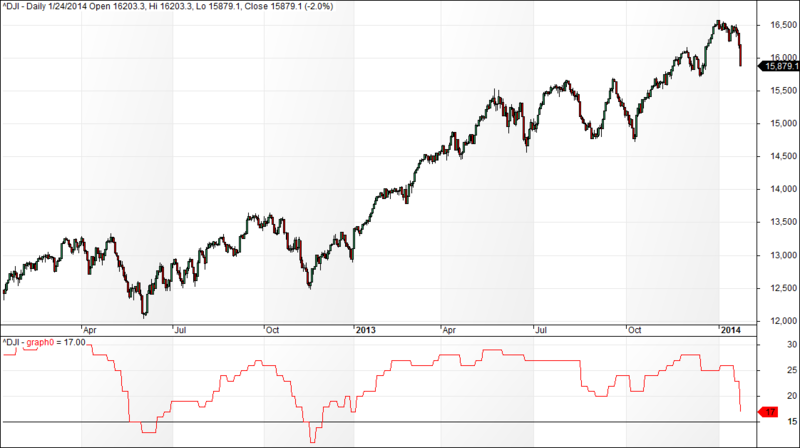 The FTSE100 is once again stagnating near its Top1 target at 6800. * In other world markets Hong Kong is turning bearish on the weekly level. * Gold tried to go into rally mode, but quickly dropped back and ended the week barely above its weekly key reversal level. A weekly close below $1280.53 would turn this market fully bearish again. * The Euro also tried to break out to the upside and was pushed back immediately, ending the week just above its key reversal level. As we have been telling for weeks, the next major move of the Euro will also decide the next move in several other markets like gold. So, we keep watching. * Our weekly key reversal levels for the 30 Dow stocks are available here. 24 stocks are bullish this week, up from 23 last week. Above 20 is healthy, see : Keeping an eye on the Dow stocks. Weakness in stock markets is evident now. I already warned last week not to trust the current lunar green period, because some important targets have been reached and too many of my indicators are flashing warning signs. With a lunar red period coming up in early February there may be more downside action in store. 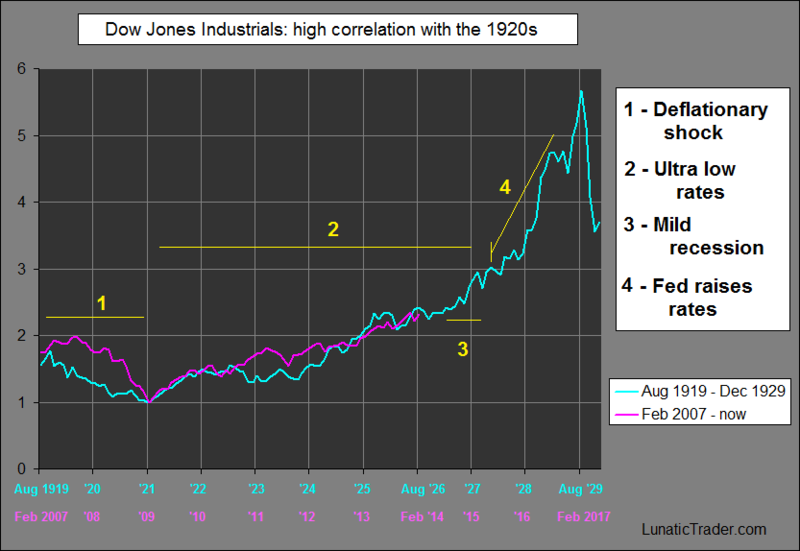 This week I will take a look at the Dow Jones Industrials Index. In a post last July ( Why Dow 16000 will be sold ), I presented a number of target calculations that pointed to 16400 (+/- 200) as a major level where selling was likely to kick in. While we didn’t reach that target in August, the Dow rose to a record 16588 in late December and is now pulling back below the 16000 level. 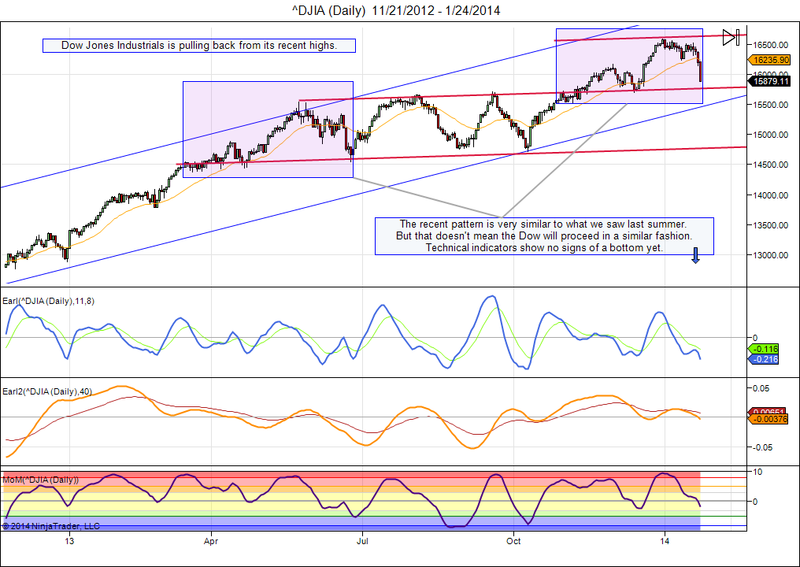 The Dow is coming close to the early December lows, where some support is to be expected. I think we will see an attempt to regain the 16000 level this week, but the more important test will come in February. Will the January lows hold or not? If the market breaks lower then we can start watching for the 15000 level. Six stocks have gone bearish last week, leaving now only 17 Dow Industrials stocks with a bullish setup on the weekly level. This is the lowest number of bullish stocks since December 2012. We got several pullbacks in 2013, but the number of bullish stocks in the Dow never dropped below 20. The current downturn appears to be of a more serious nature. The market will have to turn up really quickly, otherwise we will soon have more bearish stocks in the Dow than bullish ones, and that would imply the start of a bigger correction. Generally speaking we have a healthy bull market when 20 or more Dow stocks are bullish. When less than 15 stocks are bullish we are in a correction if not a bear market. For a conservative investor, a good way to stay out of trouble is to go underweight stocks when the number of bullish stocks in the Dow drops below 20 (or buy some options for protection), and get out completely when the number drops below 15. Then, get back into stocks when the number of bullish Dow stocks climbs above 20 again. As the market started going down from record highs in 2007, the number of bullish stocks quickly fell below 20, and by early 2008 it dropped below 15. So, that was a clear sign to get out. It briefly rose back above 20 in May 2008, so one would have bought at that point. But that didn’t last long and soon the number of bullish stocks was back below 15, so out of the market again. In April 2009 the number of bullish stocks rose back above 20, and this proved to be a more profitable buy signal. It is a simple method and only takes a few minutes per week. It isn’t perfect, but one can use it to avoid the major pitfalls and will always be on board whenever there is a strong bull market.